Families in northern Queensland will see supermarket shelves restocked over the coming few days as the Queensland Government and retailers, Coles and Woolworths pull out all the stops to get trucks through the flood waters. A specially convened group of major supermarket retailers has been working with the Government and Emergency Management Queensland to identify the areas of most need and provide support to get the trucks through as quickly as possible. In addition to the trucks, Bligh has called in the assistance of the Australian Defence Force to fly supplies in to Coles and Woolworths stores in Rockhampton. In addition to giving their logistical support, Coles has pledged $1 million in relief donations to the Premier’s Flood Relief Appeal, with a further $270,000 being donated by its customers in stores. Food deliveries to 34 Coles stores in Queensland have been affected by the current floods. 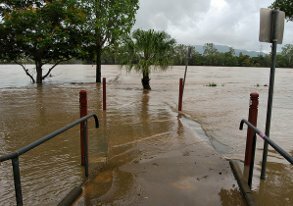 Coles Emerald has been forced to close due to floodwaters, with stores in Bundaberg and Rockhampton also on high alert. With road and rail access cut, the affected Coles stores are rapidly running low on stock. Coles Operations Director Stuart Machin said Coles was working closely with the Queensland Government’s Emergency Management Team to look at all options for getting food deliveries into affected regions. “These are obviously very challenging circumstances, and we want to thank our customers for their patience and assure them that we’re doing everything we can to get food deliveries into our stores as quickly as possible,” Mr Machin said. Premier Anna Bligh thanked the supermarket retailers for their hard work to replenish supplies across Queensland. “They have literally pulled out all stops to get trucks on the road to get fresh supplies into communities that have been isolated through flood waters,” Bligh said. The Premier confirmed that in the last 24 hours some 2772 pallets amounting to over 1582 tonnes of essential items and 478 tonnes of fresh food has passed through floodwaters on its way to Cairns, Townsville, Mackay, Rockhampton and Gladstone. “Included in these figures is some 250 tonnes on priority routing into Rockhampton stores, with the first loads likely to reach the city this afternoon,” she said. “But I would just say to shoppers, please be aware and considerate of your neighbours and avoid panic buying. Blight said yesterday that the Australian Defence Force had lent their assistance to fly supplies into areas not yet reachable by truck. “With the ADF’s support, C130 aircraft will be loaded and flown to Mackay airport as it is not possible to get into Rockhampton with its airport closed. “Trucks laden with essential non-perishables including toilet paper, nappies, long life milk, bottled water and canned food have already started arriving at the RAAF Base at Amberley,” Ms Bligh said. “From Mackay, Toll Transport is again providing support by transporting the goods on road freight to Rockhampton. “It is anticipated there will be up to four trips today, with each trip transporting 15 pallets of goods. This operation follows resupply late last week of 250 tonnes of food, fruit and vegetables into Rockhampton by truck as part of a major operation to resupply major centres north of Rockhampton. The Premier said Rockhampton residents face a long period of hardship with the Fitzroy River expected to reach 9 metres today with further rises up to 9.4 metres by Wednesday. “The road network around Rockhampton is severely hindered with highways to the south and west expected to remain cut. The highway to the north will be cut when the water reaches 9.4m,” Ms Bligh said. “Already about 1000 properties have water in their yards and about 150 homes have been inundated. As the waters rise, electricity supply is being cut to more homes to ensure community safety. “A growing number of people are taking refuge at the evacuation centre at the Central Queensland University,” said Bligh. Machin said he hoped Coles’ donation to the Premier’s Flood Relief Appeal would help the thousands of Queenslanders affected by the state’s worst floods in fifty years. “These floods are affecting our customers, team members and stores in Queensland, so we felt it was important to show our support for the flood victims,” Mr Machin said. “This is a terrific response in such a short time, and a testament to the generosity of our customers for those in need”, Mr Machin said. Mr Machin said that while half of the customer donations have come from Queensland, customers around Australia have also been extremely generous in their support. Margy Osmond, CEO of the Australian National Retailer’s Association (ANRA) said there had been some concern that food and essential items were running short in a number of communities. “We want to reassure shoppers that we are working hard to make sure that what they need is on the shelves,” she said. In addition to fresh food, other essential items on the way north will include: long life milk, bottled water, flour, toilet paper, baby formula, disposable nappies, and canned beans/spaghetti. “We would like to thank the Government for recognising the need to streamline access for Woolworths and Coles so that they can continue to support the communities that have always supported them,” Mrs Osmond said. “The Supermarkets working group will meet daily during the current disaster to ensure that as water levels rise and routes close, trucks can be diverted and the flow of essential supplies runs as smoothly as possible. “In addition, the Government has taken steps to allow stores to open and trade during what would have been closed holiday periods, to ensure that shoppers can restock their cupboards. Two Australian women on a mission to reduce food waste have launched a new vodka made using carrots. Coca Cola Amatil has acquired Western Australian independent brewer Feral Brewing Company.